Successfully Added RCA Composite Cable + USB for iPhone, iPod, iPad to your Shopping Cart. RCA Composite Cable + USB for iPhone, iPod, iPad: Appreciate movies straight on your awesome LCD TV and music through your powerful Hi-Fi system! Use this RCA Composite Cable to transfer movies from your iPhone, iPod or iPad directly to your TV to enjoy stunning visual effects on a huge flat screen! You can also connect your iPhone, iPod or iPad to your home stereo system, thus enabling you to listen to your favorite songs on your home stereo speakers for a room-filling audio experience! 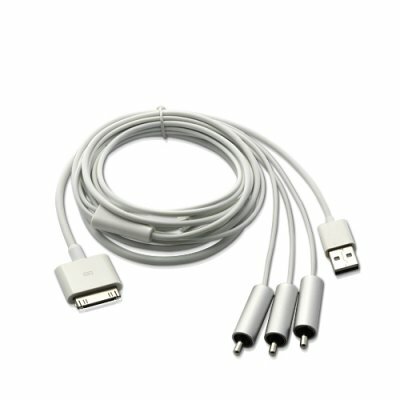 This iPhone/iPod/iPad RCA Cable comes with a USB connection that allows for a direct charge through any USB power source, such as a laptop or USB power adapter. This premium quality Apple cable supports all iPhone, iPod Touch and iPad models. This great iPhone, iPod and iPad accessory is brought to you at an amazing low wholesale price by Chinavasion. Click "Add to Cart" right now, and we'll express ship you a sample. Then list this Apple accessory on your drop ship website or eBay-listing page and start making awesome profit. If you're a store owner, then purchase in bulk for greater discounts and see them flying off the shelves at an incredible speed! RCA cables are color coded for easy connectivity. Use the USB to charge your iPhone, iPod, iPad. Great wholesale gadget for selling on eBay and drop ship websites. Purchase in bulk and receive great discounts, then display them in your physical store for your customers. Everything iPhone related sells like crazy, everywhere you look, you'll see someone with an iPhone and pretty much everyone has an iPod or iPad. Cash in on serious profits today! on 2011-10-01 07:27:28 compatible with iPhone 4 and 3G? i have a jailbroken iPhone 4 running on iOS4.3.2 and i was wondering if this is a legit cable.. because i was looking through google which cable would be compatible with my iDevice.. if this is working on iPhone 3G iOS4.2.1 and iPhone 4 iOS4.3.2 then i will order 2 cables directly in one time.. can someone give me a confirmation just to make sure that this will work on my iDevices.. thanks in advance.